As enrollment statistics in the new health insurance marketplaces start to become available, there is a growing focus on whether the enrollment of so-called “young invincibles” will be sufficient to keep insurance markets stable. Enrollment of young adults is important, but not as important as conventional wisdom suggests since premiums are still permitted to vary substantially by age. Because of this, a premium “death spiral” is highly unlikely. Why does the age distribution of enrollees matter? The Affordable Care Act (ACA) requires insurers in the individual market to cover anyone who wishes to enroll and restricts how insurers can vary premiums based on enrollee characteristics. Premiums cannot vary at all based on health status or gender. Premium variations based on age are limited to a ratio of three to one (meaning the premiums for a 64 year-old is three times the premium for a 21 year-old). Previously, premium variations based on age were more typically about five to one. The limit on age rating means that, on average, older adults will be paying premiums that do not fully cover their expected medical expenses, while younger adults will be paying premiums that more than cover their expenses. For this system to work, young people need to enroll in sufficient numbers to produce a surplus in premium revenues that can be used to cross-subsidize the deficit created by the enrollment of older people. If that does not occur, premium revenues will fall short of expenses and insurers may seek to raise premiums the following year. Figure 1 illustrates how average costs for adults vary by age relative to the allowed premium variation allowed under the ACA.1 Generally speaking, adults in their late 30s to late 50s will pay premiums that are about the same as what they would pay without any restrictions on age rating. Younger adults pay more than they would without any age rating limits and older adults pay less. Also, risk pooling occurs state by state, so if one state enrolls a substantial number of young adults, it will not help the insurance market in a state that is less successful. How many young adults does the market need? Currently uninsured or buying their own insurance already. Not eligible for Medicaid or affordable employer coverage. Using the basic approach described here, we analyzed the Survey of Income and Program Participation to estimate the age distribution of potential individual market enrollees. As Figure 2 shows, 40% of the potential market is represented by adults age 18-34. In setting their premiums for 2014, each insurer had to project who they thought would enroll. Some insurers may have been optimistic, assuming proportionate enrollment of young people. Others may have been pessimistic, and set their premiums somewhat higher across-the-board as a result. Because the ACA includes a risk adjustment system that transfers funds from individual market insurers in a state with younger and healthier enrollees to those with older and sicker enrollees, what really matters for next year is the demographic composition of actual enrollment in total in each state compared to what insurers as a whole projected. In the future, the goal remains to get a proportionate mix of enrollees by age in a given state. What happens if enrollment among young adults falls short? Because young adults will be cross-subsidizing older adults, they need to enroll in sufficient numbers for that cross-subsidy to be sufficient. In other words, if 7 million people enroll in the new health insurance marketplaces – which is what the Congressional Budget Office has projected – then 40% of them (or 2.8 million) would need to be young adults (assuming a similar proportion enrolled in ACA-compliant plans outside of the marketplaces as well). If 5 million people enroll, then the target for young adults would be 2 million. If enrollment among young adults falls short, then the total amount of premiums collected by insurers will be less than the total health care expenses of enrollees plus administrative overhead and profit. And, if insurers believe that those enrollment patterns will continue into 2015, then they may raise premiums higher to compensate for the loss. However, because premiums are still allowed to vary substantially based on age, the financial consequences of lower enrollment among young adults are not as great as conventional wisdom might suggest. Scenario 1: Young adults age 18-34 enroll at a 25% lower rate than other individuals relative to the potential market. 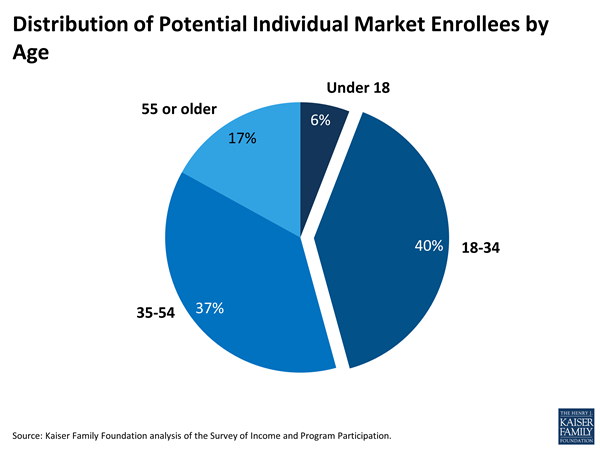 Under this scenario, young adults would represent 33% of individual market enrollees instead of 40% as in the potential market. Taking into account the allowed three-to-one variation in premiums due to age, we find that costs (health care expenses plus overhead and profits) would be about 1.1% higher than premium revenues. Scenario 2: Young adults age 18-34 enroll at a 50% lower rate than other individuals relative to the potential market. Under this scenario, young adults would represent 25% of enrollees, substantially less than their share of the potential market. It is roughly comparable to what Covered California reported for October and November (the first two months of open enrollment), with 21% of all enrollees who picked a plan in the 18-34 age range. However, this is likely a worst-case scenario, since the expectation is that older and sicker individuals are more likely to buy first and that younger and healthier people will tend to wait until towards the end of the open enrollment period (which concludes March 31, 2014). In fact, our recent survey of people in California who are uninsured found that 58% of young adults said they planned to get coverage in 2014. But, if this more extreme assumption of low enrollment among young adults holds, overall costs in individual market plans would be about 2.4% higher than premium revenues. Insurers typically set their premiums to achieve a 3-4% profit margin, so a shortfall due to skewed enrollment by age could reduce the profit margin of insurers substantially in 2014. But, even in the worst case, insurers would still be expected to earn profits, and would then likely raise premiums in 2015 to make up the shortfall, However, a one to two percent premium increase would be well below the level that would trigger a “death spiral,” which would occur if insurers needed to increase premiums substantially, in turn further discouraging young and healthy people from enrolling. However, questions about health and pre-existing conditions are no longer asked on insurance applications, so we will not know for quite a while whether sicker people are enrolling at a higher rate than healthier people. If they do, there are some “shock absorbers” built into the system, including risk corridors (where the federal government shares financially in an insurer’s gains or losses beyond a specified range) and reinsurance (where the federal government covers a portion of the cost for people with high health expenses). Achieving a balanced risk pool in the individual insurance market will help to make it an attractive market for insurers and keep premiums down over time. Conversely, enrollment of a disproportionate share of older and sicker people will tend to drive premiums up. However, premiums are not as sensitive to the mix of enrollment as fears about a “death spiral” suggest, particularly with respect to age. It is important to attract the “young invincibles,” but maybe with a greater focus on the “invincible” part. Average costs by age are based on an average of pre-ACA rate tables that reflect no limits on age rating, as well as variations in health costs by age in an analysis sponsored by the Society of Actuaries. 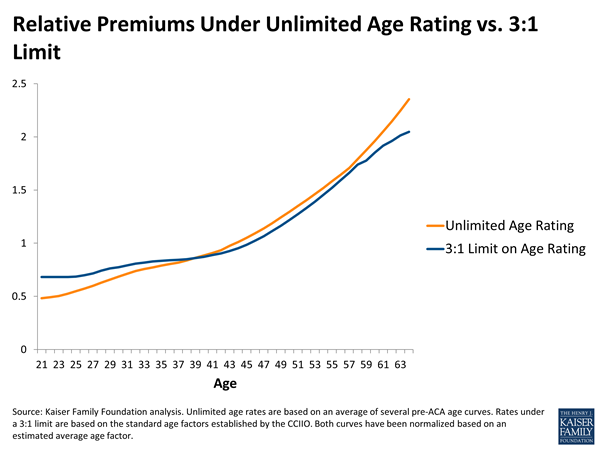 Relative premiums under a three-to-one limit on age rating are based on the standard age factors for the individual market for 2014. All amounts have been normalized based on our estimate of the distribution of potential enrollees in the individual market by age. Undocumented immigrants are not eligible to purchase insurance in the new health insurance marketplaces. They can buy insurance directly from insurers, but are not expected to do so in large numbers. For each of the two scenarios, we projected what total costs would be for the assumed age distribution using an estimated variation of costs by age, and then compared that to what premium revenues would be using the standard age factors with three-to-one allowed variation in premiums. We assumed that administrative overhead and profits were a constant percentage of claims across age groups.